No matter how long I’ve lived with “spring forward” and “fall back” it still seems to jet lag me. I have been tired and crabby all day, and if this year is true to form, I’ll start feeling normal around Wednesday. 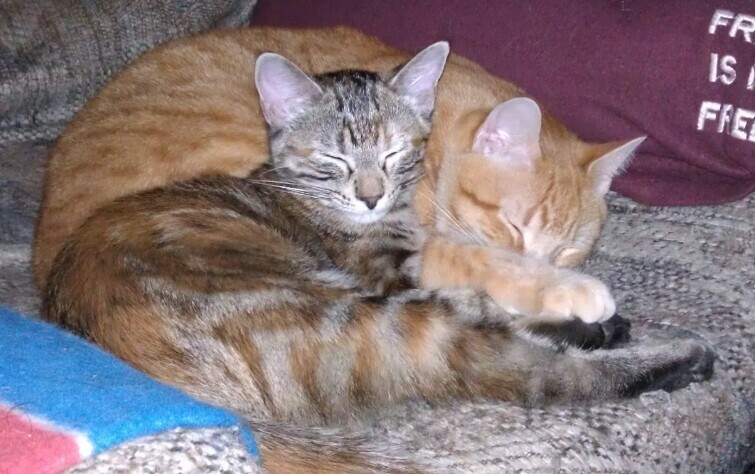 So for now, please enjoy these gratuitous kitties enjoying a cat nap — something I’d like to enjoy as well! It is a gross understatement to say that this past week has been a bad one for so many people. With friends and acquaintances facing losses great and small, and with so many others both known and unknown to me working through the aftermath of Sandy, I can’t bring myself to say very much tonight. I don’t want to tell stories that aren’t mine to tell, and I’m just not in the mood to take some of my usual trivial topics and be a smartass. Maybe tomorrow. Just not right now. I will take a second to moan about the end of daylight savings time. I don’t mind falling back quite as much as springing forward as the extra hour to enjoy or sleep is not unwelcome. But I still wish that the rest of North America would follow along with those places that don’t observe it at all. I’m having a tough time getting back into the rhythm of daily writing. As I’ve mentioned before, November is not the best time for me to start any kind of involved personal project. Today was a particularly aggravating day with no chance to enjoy the unseasonably mild weather. All week, AT&T repair trucks have been working in the alley behind the house, mostly blocking our garage. It has been a real inconvenience, plus I hate to open the garage when strangers of any variety are around. The work day started early and ended late. In between, we were missing several people due to illness or minor emergencies. When I finally got home, it was to the news that one of our neighbors had his home broken into. I know I have complained about the jagoffs in my neighborhood quite often. The neighbor whose home was broken into is not one of them. He is a very nice older gentleman who certainly did not deserve the headache. Thankfully he was not home at the time, and the only saving grace is that the scumbag criminals did not hurt his dog. Not physically, anyway. I hope she was not too traumatized by the invasion. I put part of the blame on another neighbor who is definitely one of the jagoffs. His constant yard sales (so many as to be in violation of city ordinances, but of course since it’s not a “real” crime nothing has been done) bring around unknowns and undesirables as well as legitimate neighborhood bargain seekers. I would not be surprised if some of the unknowns were also casing out the area for easy marks. I’ve always bought into the conventional wisdom that having a dog is a deterrent to break-ins. Now I’m not so sure. I do know that when the Rottweilers bark and growl at unknowns or unfriendlies, I won’t be making an effort to stop them any longer. 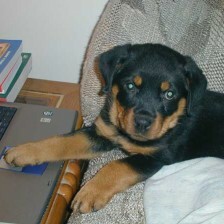 This is one time that I plan to use the stereotype of killer Rottweilers for good — our good. I truly hate that I feel I have to do that. Now where did June go? I never did find out where May went. Now June is just minutes away from being gone as well. I want to say I’ll be back to blog on a regular basis soon, but I wanted to say that at the end of May as well. We’ll see what happens after the holiday weekend. I am looking forward to possibly photographing some fireworks, though. I’ve been waiting to use what I learned in the night photography class I took earlier this year. I haven’t used my DSLR all month, and if I took even five other photos with my point ‘n’ shoot or phone, I’d be surprised. I’m off to take some time to review those techniques! I’ve mentioned before that sometimes I live under a rock. This rock was a happy place, where rebates arrived as normal paper checks that had to be cashed or deposited within 90 days and all would be right with the world. Although it has apparently been a trend for some time, last month was the first time I ever received a prepaid debit card instead of a check for a rebate. I’m not liking it. These prepaid debit cards are almost as annoying as gift cards, and have few of the same protections that gift cards have under the law. Gift cards don’t have expiration dates or maintenance fees, but debit cards do.